It is no secret that The Carolina’s are full of scenic beauty throughout both North and South Carolina. So much so that you could literally spend a lifetime in either state and still not see everything there is to see. As a tourist that is only visiting for a short time, what is the most effective way to see as much as possible? The Van in Black! The Van in Black is more than just a simple van service. We know the area and can show you to places that are not going to be covered in your typical travel manual. Furthermore, we know the best times to visit all the different areas. Do you want to visit top destinations during peak crowds or sneak in when less people are there? 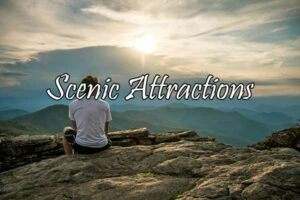 These are the insider benefits you get when you book a scenic tour with a transportation company that is locally owned and operated. If you are visiting the Carolina’s and want to really see the Carolina’s, give us a call and let’s chat. If nothing else, we can give you some local guidance and tips over the phone to help you plan your trip. It would be our pleasure!